The second weekend of July I drove up to Wisconsin for my dad’s family’s annual reunion at my grandma’s farm. It’s an eight-hour drive to my parents’ house, and then another three and a half up to the farm, so over the whole trip I had almost a full 24 hours in the car, alone. I decided that instead of listening to my same tired old playlists on my iPod, I’d take the plunge with audiobooks, of which I have been recently curious. A long trip alone in the car seemed like the perfect opportunity to start. And it was! 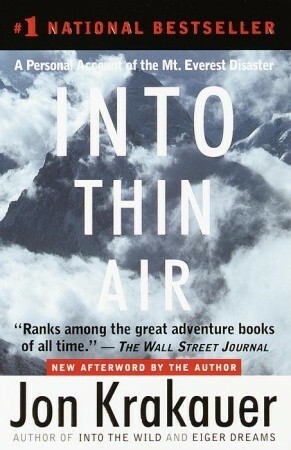 I started with a book I read in 2009: Into Thin Air by Jon Krakauer. I loved this book; I read the whole 300+ page memoir in two days. Listening to the 8-hour audiobook, unabridged and read by Krakauer, was nearly the same experience for me as reading. I was captivated. His voice is steady and clear, with a palpable reverence for the mountain and the people, and twinge of appropriate remorse. Krakauer’s descriptions are straight-forward and highly detailed. I found myself holding my breath during intense, harrowing moments—tiptoeing down an inches-wide path with a precipitous drop on either side, traversing an aluminum ladder screwed into the ice over an infinitely deep crevasse, running out of oxygen and realizing there’s not enough time to get to the next tank. And then horrified by the harsh reality of being up there—rescue is near-impossible and often climbers are abandoned on the mountain to freeze to death, trekking past fallen and frozen climbers from years earlier on your way to the top. Speaking of, the top is really only the halfway point of the journey. You still have to summon the energy and willpower to make it back down. I appreciated the inclusion of some Everest history and geographic layout, and Krakauer’s obvious respect for the Sherpa people. His descriptions of climbing equipment and the procedural aspects of the sport are accessible to non-climbers, as well as the process to scale Everest specifically. I think Krakauer does a great job of expressing his emotions during his time on the mountain, from initial excitement and enthusiasm to eventual confusion, sadness, utter exhaustion, and numbness. Due to the effects of the altitude on his constitution his memory of certain key events are blurred, and he tracks down as many separate accounts as possible in order to understand the correct version, but conflicting information among survivors is inevitable. Krakauer admits to being at fault, admits to actions of his resulting in deaths, and conveys guilt and sadness. This is an absolutely haunting, heartrending, emotionally complex memoir that I’m sure I’ll revisit again. Read in January 2009; listened to audiobook on July 12, 2012. This entry was posted in books and tagged audiobook, memoir, non-fiction, survival, travel by kristin @ my little heart melodies. Bookmark the permalink.